My friend Marco from Muenster gave me a lift to Cádiz the oldest town in Europe. There I just wanted to relax and get some ideas for my blog in sense of what I could add to it etc. The atmosphere was perfect for that! A lot of creative energy and very nice and easy going people. 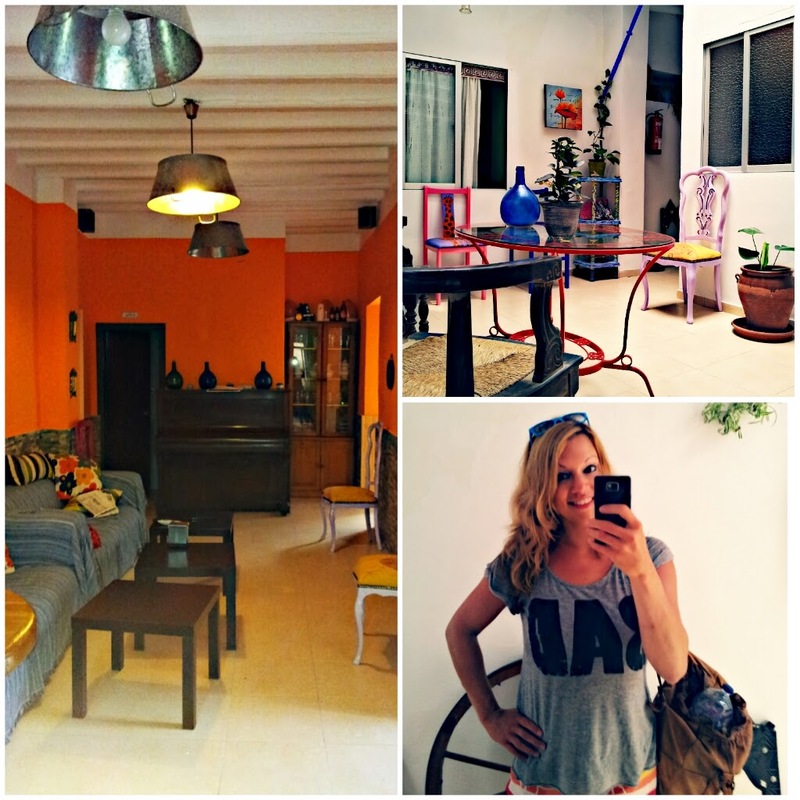 I lived in a very nice and cosy hostel where I felt home: the DeCadiz Cadi. Moreover I went for free to the No Sin Música festival, I watched with a Portuguese guy from Stuttgart the game Germany vs Portugal and I met there very nice girls. Through one of them I found my next volunteer job in Spain. 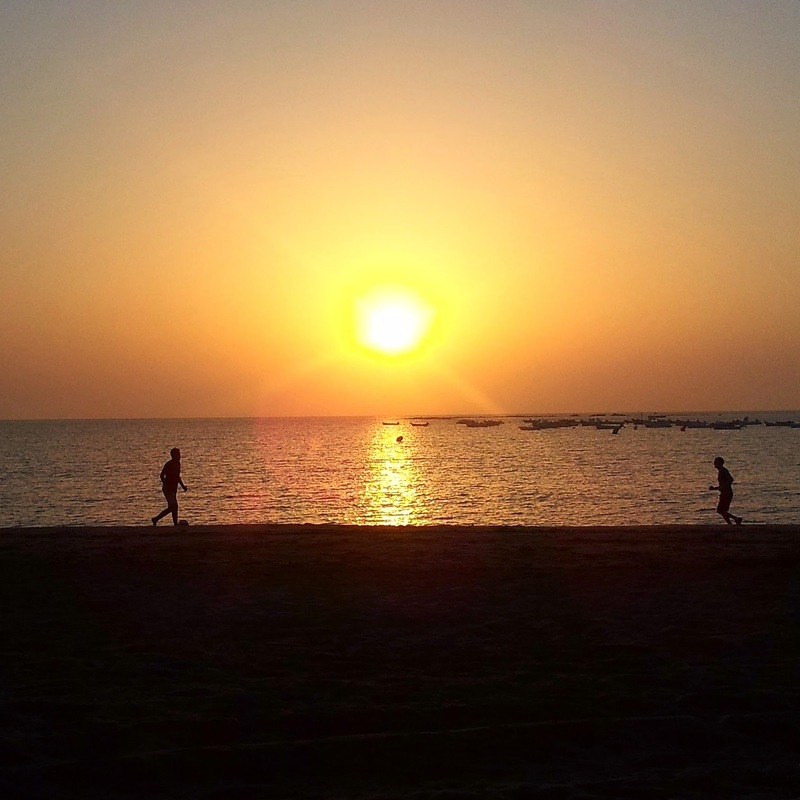 I took this photo at my last evening in Cádiz. For me it mirrors the great atmosphere there and freedom of the creativity. My tour through Spain so far. 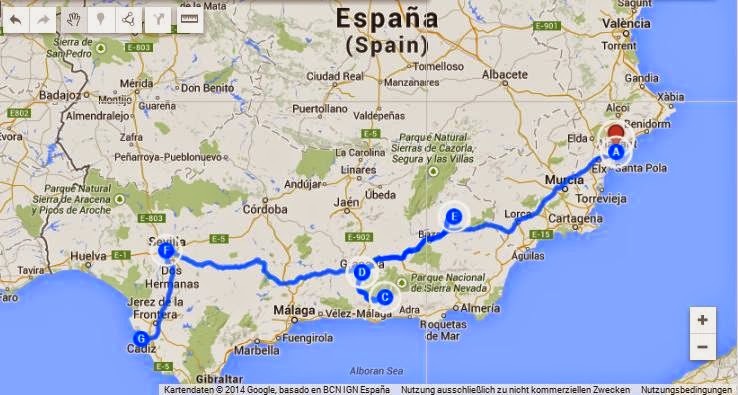 Around 1.560 km since I started in Alicante on the 30 of April 2014. "I am in Cádiz!" I already booked a hostel for the next two days there. But the first night I had to spend in another hostel because I left Seville one day earlier with my old friend Marco from Muenster who gave me a lift. I had time for reflection my journey so far. 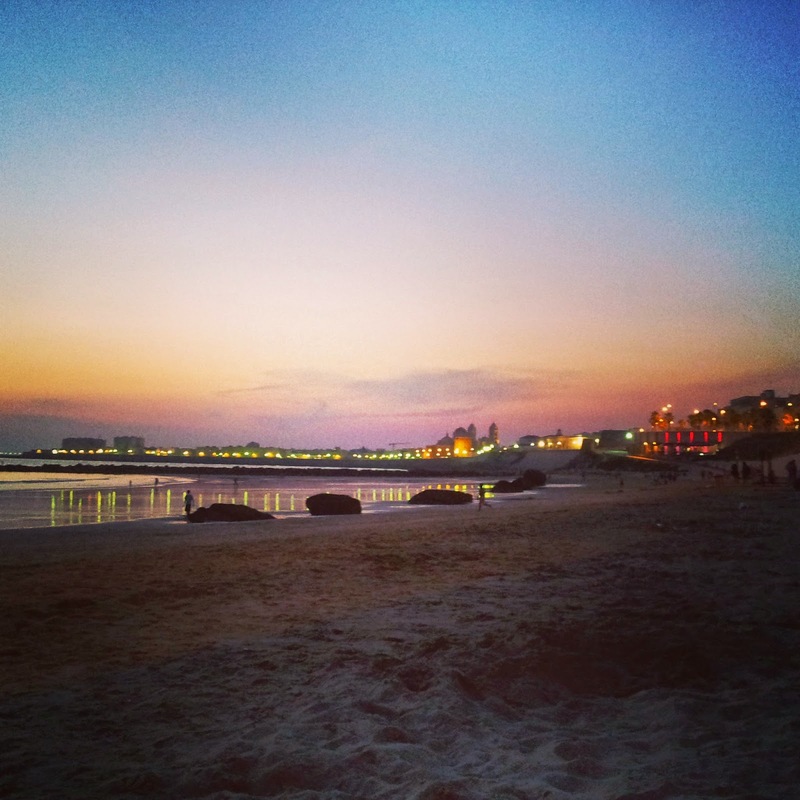 My first evening in Cádiz at the beach... So beautiful. Great place for reflection. 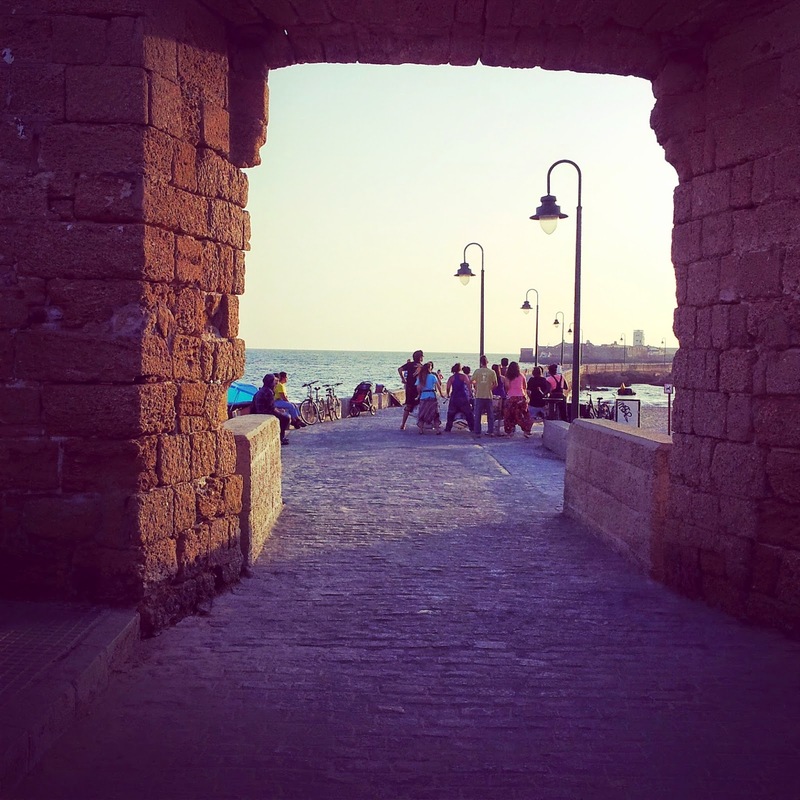 Cádiz is not even the oldest town in Europe it is also the place where the famous scene of Halle Barry's coming-out-the-water scene was made for James Bond. It tried it as well but it didn't work. I guess it was my bikini ;-). The first hostel was a typical backpacker one. That means quite loud, busy and fast changing faces. I mean that is fine but not for me. But there I met a very nice girl: Ksenia. I saw her at the breakfast carrying her camera in one hand. I just thought: "Hmmm, she went very early out to take some photos. I bet she knows some nice places where I can take some as well!" I talked to her and she gave me some advice. We also talked about what I was doing and her eyes started to glow. She was very excited and told me that she also was considering to do also something what I do. I wrote my blog down for her and the sites where I find the hosts. It was really nice to see that she was so happy. It felt good to inspire her a bit. That is that what I want to do: giving impulses with my stories. Apart from my first day I spent my time in the the DeCadiz Cadi. I immediately felt very comfortable there. Such a nice place with a lot of self-made things like turning old chairs into a beautiful pieces! A few days before I wrote to Yeray on WhatsApp that I was going to Cádiz and he wrote to me that there are a lot of artists as well and I will like it there. In this hostel I could see the creative energy. DeCadiz Cadi me gusta mucho :-). So good that I stayed over a week. The owners Maria and Rafa spoke just a little bit English. But I could understand. They both were very warm and kind persons. I asked if I could extend my stay. No problem. Great. On the whole I stayed 9 days there and I had liked to stay longer... Maria and Rafa cooked everyday and they offered the leftovers to me and the other guests. It was not like the normal hostel life. For me it was really like coming home. I had a room which I shared with other girls. Jessie from Holland and Liza from Berlin. I went everyday to the market and bought fresh fruits, vegetables, fish and meat for little money. That means I paid for 3 peaches, 3 bananas and some tomatoes around 2 euros... That's possible because the farmers live very close and sell there stuff on the market. But Andalusia is on the other hand the areas with the highest rate of unemployment. Just to give an overview. I also went one day to a Pilates class which was great. I did things I would do at a place where I would live. 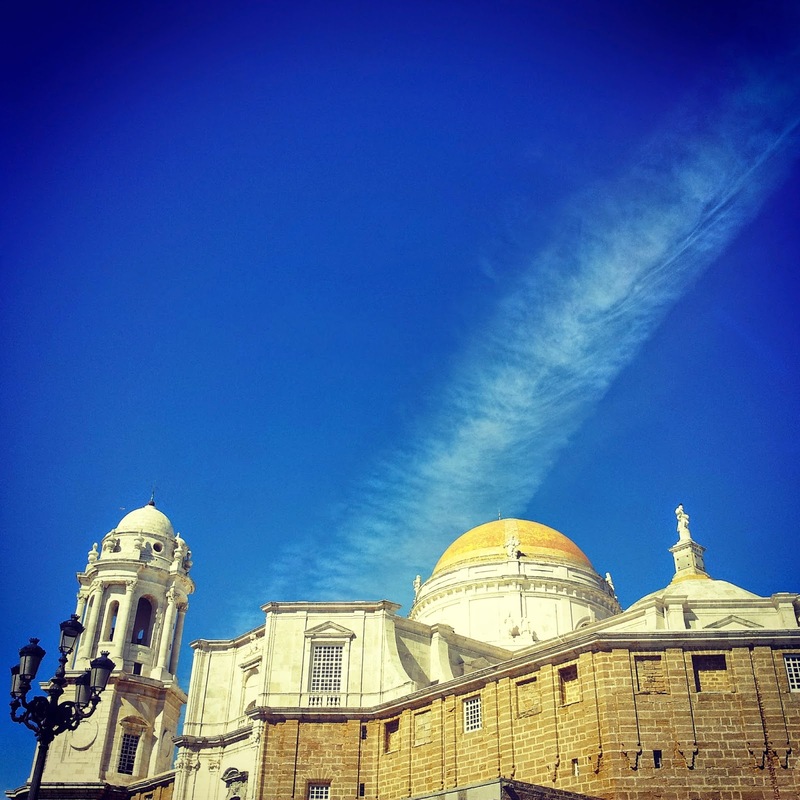 Cathedral in Cádiz and the beautiful blue sky! I was just on my way back to the hostel when I listen to the sound of drums. I seated myself on the wall and just listen to it for a while. One evening I was on my way back 'home'. I had a nice day at the beach and later I went into a bar and wrote a bit in my notebook. I felt really great at that day and in balance. I was reflecting my experience so far and my personal development. It was a great eye opener for me and I became aware about some things which I wrote down. I was really relaxed, felt in balance and went slowly back to my hostel when I suddenly listen to loud music. I followed the music and I found the place where it came from. There was a festival which named No Sin Música. It was held on a place which was surrounded by walls apart from the entrance. Suddenly, two Spanish girls came to the fence and said something in Spanish to me. I: "No hablo espanol..." They: "We have one ticket left." "Cool! Cuando es?" "Nada!" "What!? Wow, muchas gracias!" So great! I went quickly to change the ticket for the necessary strap, went to the security guys, smiled broadly and went in! I have to mention that I still wore my beach outfit. That means flip flops, my long red skirt, pink tanktop and my handbag with a beach towel. But I didn't care and looked for a possibility to have some food and something to drink. I queued at a kebab and found out that I had to change money for plastic coins. The guy who gave me the kebab just said were I had to change it and let me go. Therefore I changed my money, flirted with a handsome Spanish guy in the queue and paid my almost finished kebab. Finally, I rocked in my flip flops, alone and when it got colder I just took my beach towel and wrapped it around my shoulders. What a great evening! I love Spain, the nice people there and especially Cádiz. The Spanish people are so nice! 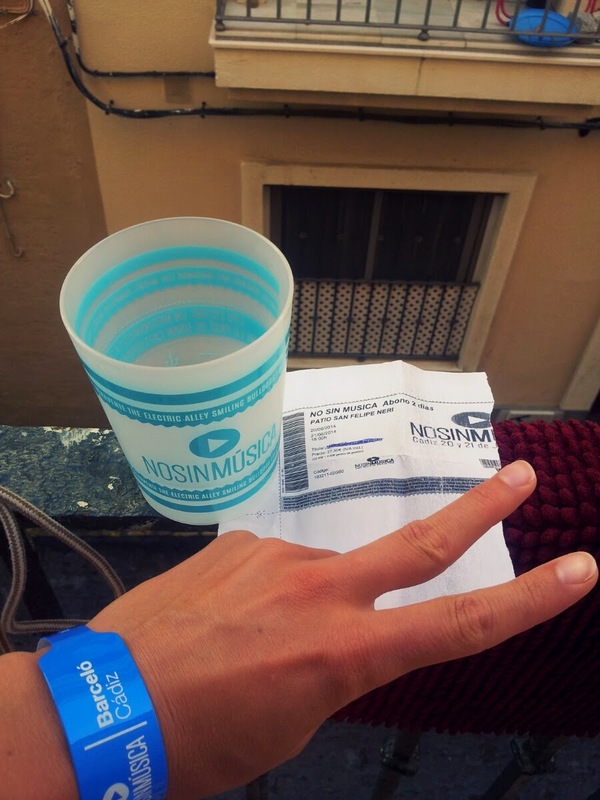 Free ticket to the No Sin Música Festival. I was sitting at the beach when an old guy came over to me, in green bath pants, laid down in front of me like a pasha and asked me something by smiling and showing his gold tooth... I said: "No hablo espanol." and took my notebook turned in another direction and wrote something. Might be unfriendly but actually it would be just waste of time for him and for me. After a while I took my stuff and went when suddenly a Spanish looking guy came to me with a friendly smile and said something in Spanish "No hablo espanol." "Where are you from?" "Germany." "Ach! Dann können wir auch deutsch reden!" The guy with the friendly smile was Cristiano who lives in Stuttgart and his parents are from Portugal. That let rang a bell... I: "Hey that is a great coincidence! Let's watch the game Germany vs Portugal together!" We found a bar where we watched it. Germany vs Portugal. Portugal lost and Cristiano was a bit upset. But just a bit. Well, Portugal lost... Cristiano was a bit upset but not that much because he was not really interested in football. It was very funny with him and I offered him to show how to meditate. I mean the meditation I learnt in Dzogchen Bearra. 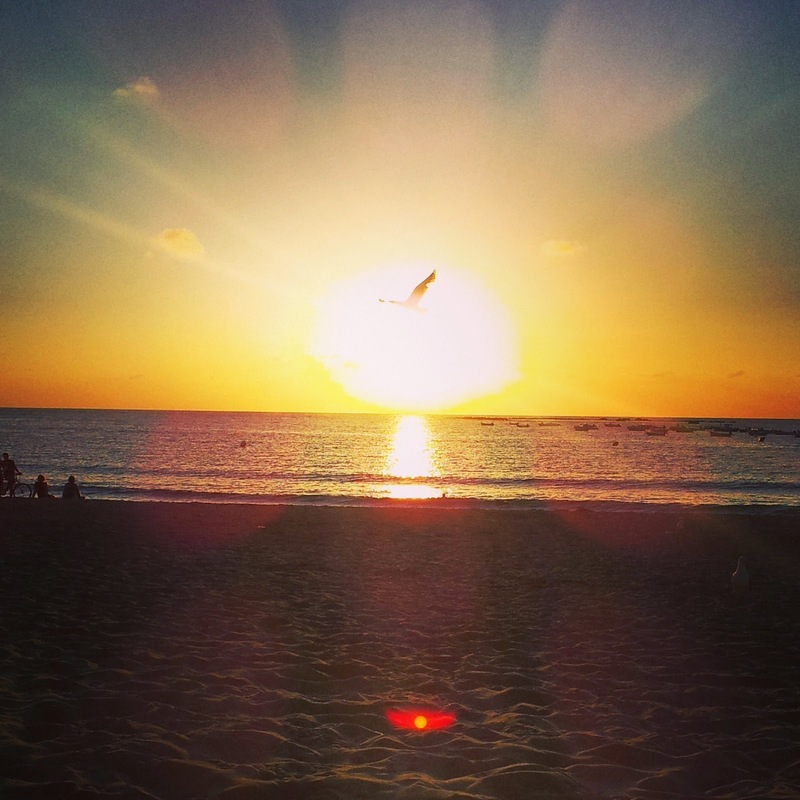 I showed it to him at the beach in front of the following amazing sunset where some people still had not enough and played football. I had lots of laughter with Cristiano and very interesting talks, about life, our own development etc. He was really kind and he was obviously a bit disappointed that we just talked. Later he brought me to my hostel and on our way there was a small group of Spanish people. One guy sang a song and a Spanish woman shouted: "QUE BONITA CANCIÓN!!!" I shrugged and asked Cristiano what she was complaining about. He answered: "She just said 'what a nice song'..." Well, it is high time that I learn Spanish and I got the proof that Spanish sounds sometimes as rude as German. Jap, I learnt on my journey that for foreign people German sounds quite rude. Interesting, isn't it? Jessie the Dutch girl was considering if she is going to meditations center close to Malaga and would volunteer there. But she was not sure and feared that everything is in Spanish. After the third chat with her I asked if she could let me know the internet address and if she would mind if I apply there. She wouldn't mind and gave me the name. It was Budismo Moderno Kadampa. Everything in Spanish?! I don't care! Great chance. I actually didn't care if it is just in Spanish or not. I supposed the place will be nice and silent. In addition I can learn more about Buddhism and meditation. I also could improve my Spanish. Therefore I checked the site by using Google Translate saw that they would like to know some references beside the application. Would you be my reference? I asked my former hosts Anne in Fereirolla and Tim in Alicante if they would be my references and I can give there phone numbers to the mediation center. They agreed and I sent my application to the center and got a confirmation :-). So that is what I mean by keeping ears and eyes open and see the opportunities and think out of the box. Like a very nice and intelligent Spanish woman with the nice name Almudena told me: "There is always a solution!" I met her in the meditation center. The story is coming soon. Actually I almost regret that I left Cádiz and went too early to Malaga. I have to admit that I don't like it. But on the other hand I had never got to know to nice people like Adriana my blablablacar driver who is a professional snowboarder from Argentina and had never caught up again and great fun with Cristiano at the Noche de San Juan with DJ Juan Magan. I also got my new tattoo there! 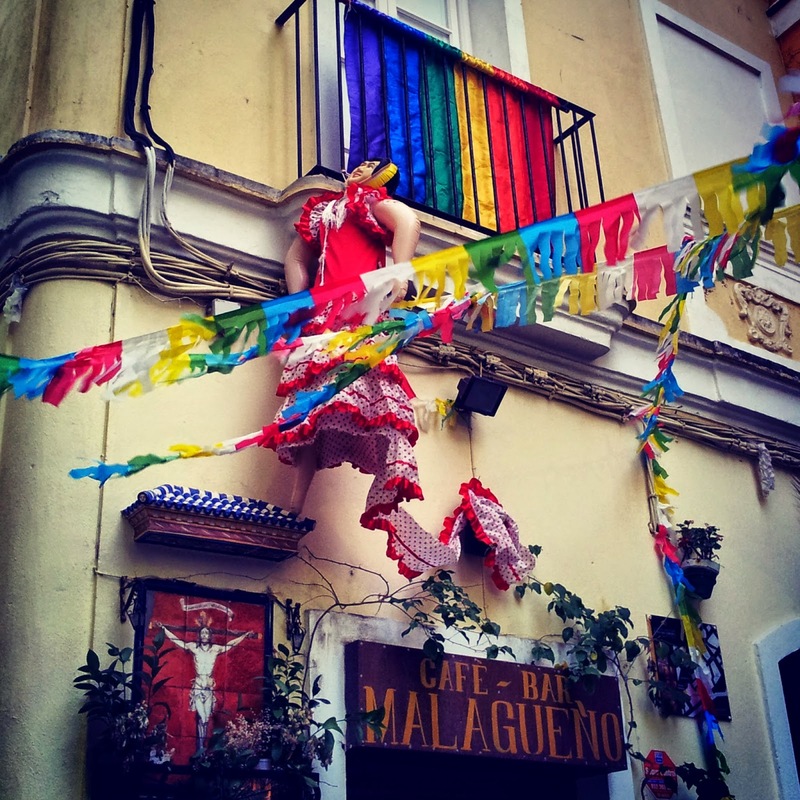 Read next time about my experiences in Malaga. Thank you very much for reading my story! See you next time. 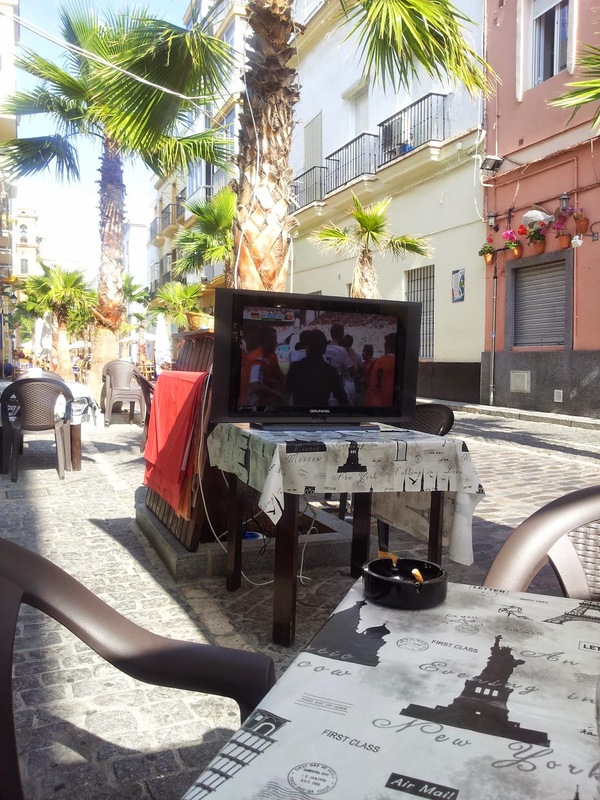 Religion meets modern world in Cádiz. That is one of the reasons why I love the city.